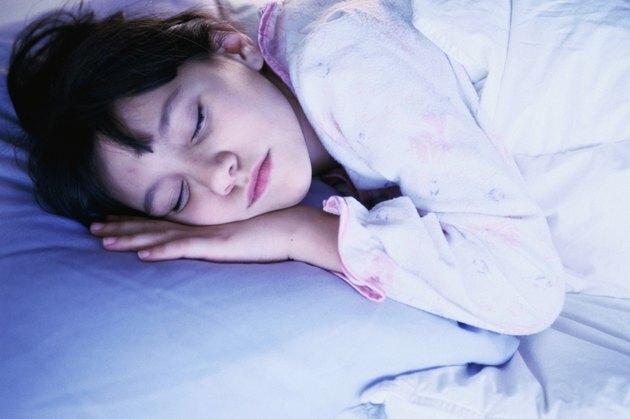 Most parents are alarmed by a nighttime fever. A fever is caused by a variety of problems; however, viral infection is most common. If your child has a fever, it’s important to know when it’s time to seek medical attention. You can also take a few steps to keep your child comfortable and hydrated during illness. If your child has a fever of 102 degrees F or higher, contact his pediatrician. If it’s after hours, your pediatrician might recommend visiting an urgent care facility. However, he will listen to your child’s other symptoms and make a recommendation. If your doctor recommends urgent care, you will need to wake your child. For a child under the age of 3 months, contact your doctor if the fever is higher than 101 degrees F, recommends MayoClinic.com. Babies have younger immune systems and need close monitoring. If your doctor recommends urgent care, wake up your infant. Before you give your child a fever reducer at night, contact his doctor. Fever reducers are usually reserved for children with a fever over 102 degrees F. Giving this medication to children with low-grade fevers might prolong illness. If your doctor recommends the medication, administer as directed. This might require you to wake your child at night. If your child wakes up in the evening with a fever, you can reduce her discomfort with a lukewarm soak. Allow your child to soak for no longer than 10 minutes. If she shivers during the bath, ask her to exit the bath. Shivering causes the muscles to shake, resulting in a higher body temperature. Dress your child in cool clothing and allow her to use a light blanket for sleeping. Keeping your child hydrated is important during a fever. If your child wakes up at night, offer him water or an electrolyte replacement fluid. During the daytime, you can also offer diluted juice and broth. For babies, keep feeding the infant on his normal feeding schedule. If your child refuses to drink or eat, get in touch with his doctor.